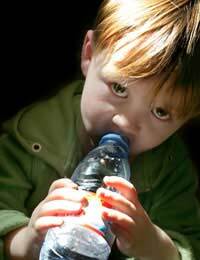 Home > Nutrition & Health > Should Kids Drink Water When Exercising? More than half of people’s body weight is made up of water. During exercise, temperatures rise as muscles work harder, and people lose water by sweating, which is the body’s way of trying to keep cool. Water is important for just about all of the processes in the body, including digesting food and absorbing nutrients, maintaining the volume of blood, lubricating and supporting joints, and carrying toxins and waste products out of the body. It’s important to top the body’s levels of water up by drinking fluids, preferably water, before, during and after exercise. Many people say that it’s important to drink eight glasses of water every day, but there is no fixed amount that’s right to drink – it’s important to drink when feeling thirsty, and to drink extra fluids when it’s hot, or before, during and after strenuous activity. Children may not recognise the signs of thirst as easily as adults may – they might need reminding to drink water during the day. Water is the easiest and most refreshing thing to drink after exercise – clean, fresh water comes out of the tap for free and it doesn’t have any calories, and there’s no bottles or packaging to throw away, so it’s greener too. Rather than buying expensive bottled water, get a water bottle, fill it up and keep it in the fridge for cool water all day. If there is no access to a fridge during the day, a water bottle left in the freezer overnight (don’t screw the lid on too tightly when it’s in the freezer as the ice will expand) will thaw gradually and remain cool during the day. To make the water a bit more interesting, try flavouring it with slices of lemon, lime or orange, or adding a little fruit juice. For general hydration, fluids can also come from food, especially fresh fruit and vegetables, and from drinks other than water, like milk, fruit juice (best if this is diluted with water for children), and squash (preferably sugar-free versions). Sports drinks can be expensive and are high in sugar – they might be good for an occasional energy boost after very prolonged exercise but shouldn’t be drunk regularly, as they provide too many calories and can cause tooth decay. It’s best to avoid power drinks that contain a lot of caffeine – these can affect concentration and cause problems with sleep, as well as causing headaches and even chest pains. When children are dehydrated, they will be thirsty and have a dry and sticky mouth, and can become flushed, tired and irritable. They may develop headaches. They may also get cramps in muscles. Their urine can become darker yellow than usual – urine should be clear and pale yellow. It is possible to drink too much water – this is known as ‘water intoxication’. This causes irregular heartbeat, and fluid in the lungs, and can cause swelling in the brain, leading to people seeming drunk, having fits, and losing consciousness. It can lead to death.